Welcome to the website of Broco Glass®, a division of Belron Canada Incorporated, having a place of business at 8288 Pie-IX boulevard, Montreal (Quebec) H1Z 3T6 (“Broco Glass®“). This website is hosted by Belron Canada. This website can be found at brocobrocoglass.ca or any alternative address (hereafter, the “website”). You will find below the terms and conditions of use for this website (I) and the general conditions of sale and repair (II) that apply to the repair or replacement of vehicle windows by Broco Glass® in its service centres. This section explains the terms and conditions of use (the “terms”) under which any individual (“you”) may use this website. Please read these terms carefully. If you decide to visit this website for any reason, these terms shall automatically apply to your use of the website. You therefore agree to consult them before using the website. This website provides information about the methods Broco Glass® uses to repair and replace the glass in your vehicle and, in general, about the services offered by Broco Glass®. You can browse this website to find information on the repair or replacement of your windshield, side windows or rear windshield without necessarily making an appointment with Broco Glass® for repair or replacement. You may contact each Broco Glass® franchise location directly and make an appointment if you decide to have your auto glass repaired or replaced by Broco Glass®. If you can provide some details on the extent of the breakage (impact, crack, etc.) and its exact location, Broco Glass® can help you determine whether you can have the glass repaired or whether it needs to be replaced. You can request an appointment based on your ability to get to a Broco Glass® location and the available time slots. If you are not sure whether your vehicle glass needs to be repaired or replaced, you can ask a Broco Glass® advisor or technician to call you back at a number provided by yourself. One of our authorized franchisee representatives can help you determine what needs to be done to repair the damage. The information transmitted at this point by Broco Glass®, either on this website or by one of our authorized franchisee representatives, is based on the answers that you provide to certain questions. This information may not be entirely accurate, and you should understand that it is provided as general information only and has no contractual significance. Only the work order for repairs written up by a Broco Glass® technician after examining the vehicle and before undertaking the work is binding on Broco Glass® franchisees. This website only allows you to find the nearest Broco Glass® location and request an appointment with a Broco Glass® technician to repair or replace your vehicle glass. The information on this website should in no way be considered to be instructions allowing you to repair or replace your vehicle glass by yourself. The general terms and conditions for repairs which appear below are for general information purposes only and are not intended to govern your use of this website. They do apply, however, to all repairs and replacements done by Broco Glass® franchise locations. When you call our authorized franchisee representative, you will be given a free detailed estimate of the work to be done on your vehicle, on the condition that you provide all the necessary information to establish the estimate. Broco Glass® will not be bound by this estimate in the event of an error or omission concerning the features or condition of the vehicle. If your insurance policy includes coverage for broken vehicle glass, the work done by Broco Glass® will usually be covered by your insurance. You may only have to pay the deductible, if any, indicated in your policy, plus any related fees (such as travel costs, night, Sunday or holiday service) or cost of accessories (wipers, bulb covers, headlights, etc.) that are not covered by your insurance. We strongly advise that you check the details of your insurance policy to determine the extent of your broken vehicle glass coverage and the terms of payment. Calculation of the estimate described in paragraph 4 of these terms will be based on your insurance policy. Also, if you plan to have the work paid by your insurance, you will have to provide us with complete and accurate information about your insurance policy. If you transmit information to Broco Glass®, you are responsible for its content and accuracy. You agree to provide full, accurate, up-to-date information in order to allow Broco Glass® to provide you with the best service, and you are fully responsible for any consequences related to the provision of erroneous information about you, your insurance, your vehicle or your broken vehicle glass. All the features available to you on this website, including but not limited to data, information, texts, documents, animated and still images, presentations, legends, graphics, photographs, videos, logos, distinctive signs, drawings, models, software programs and brands (the “features”), are the exclusive property of Broco Glass® or its licensors and are protected by the Copyright Act and other Canadian laws, foreign laws and international treaties governing copyright and intellectual property. All rights related to intellectual or industrial property, brands, domain names and other distinctive signs on this website are the property of Broco Glass® or their respective owners who have authorized Broco Glass® to use them, and any unauthorized use or exploitation of them is at your sole risk. Broco Glass® and its logotype are registered trademarks of Belron Canada Incorporated and/or affiliated company. You may use this website or the features it contains for strictly personal, non-commercial purposes, on the condition that the rights of Broco Glass® are respected. The license granted accordingly by Broco Glass® is non-exclusive, non-assignable and non-transferable. You agree not to undertake any scheme or action infringing on this limited license granted to you by Broco Glass®. These terms and conditions of use can in no way be interpreted as conferring any property rights on you or any third party. All rights not expressly granted herein remain the exclusive property of Broco Glass®. None of this website’s features may be modified, reproduced, copied, duplicated, sold, resold, published, communicated, distributed, broadcast, represented, stored, used, rented or exploited in any way, in whole or in part, with or without consideration, by you or by a third party, by any means or methods whatsoever, whether known or unknown at present, without explicit prior permission in writing from Broco Glass®. The hyperlinks on this website lead to third-party sites that are not published by Broco Glass®. They are provided strictly for your convenience, to help you make use of the resources available on the internet. If you use these links, you will leave this website, and you agree to use third-party sites at your own risk and, if applicable, in accordance with their own terms and conditions. You acknowledge that Broco Glass® neither controls nor contributes in any way to the development of the content or any other aspect of any or all of these third-party websites. Consequently, Broco Glass® cannot be held liable in any way due to these hyperlinks. Furthermore, you acknowledge that Broco Glass® cannot represent warrant or take charge of any or all of the content or aspects of any or all of these third-party websites. Broco Glass® expressly reserves the right to revoke the permission granted in this section and to take all appropriate measures in the event of a failure to comply with this section’s provisions. You will be held liable for any damages related to or resulting from such noncompliance. Broco Glass® in no way guarantees that access to this website will be uninterrupted, easy, reliable, correct, full, satisfactory, error-free or fast. Likewise, Broco Glass® in no way guarantees the longevity or stability of this website. Nor does Broco Glass® guarantee that the information on this website will meet your personal needs or be reliable, uninterrupted or error-free. Broco Glass® makes every effort to communicate information, procedures, methods and other data that are reliable, up to date and accurate, and takes all necessary measures to modify or update this information in a timely fashion. However, Broco Glass® cannot guarantee that all of the information and contents currently on this website are wholly reliable, accurate or up to date. The information on this website has no contractual or official value. Consequently, you acknowledge that you are using this information at your own risk. Broco Glass® does not guarantee the security of exchanges through electronic communication and is in no way liable for damages resulting from your use of the network or from threats such as viruses, bugs, malicious code, Trojan horses, logic bombs, worms and other anomalies that may occur on the internet. Broco Glass® cannot be held liable for any indirect damages or loss of profits, revenues, business, data, customers, time, damage to goods or equipment, or cost of replacement goods or services that may result from accessing or the inability to access this website in whole or in part, or from the use of or inability to use the information or any other feature of this website. To facilitate your navigation on this website, Broco Glass® uses session cookies. These cookies are cached in your computer memory and keep track of your personal data while you are on the website. This information is erased when you leave the website. However, Broco Glass® may use session cookies to obtain anonymous information about your use of the website in order to optimize navigation of the website. A pop-up will inform you about the information being collected by the cookies, the purpose of the collection, the recipients of the data and your access rights. This window allows you to deactivate the cookies and clearly explains the step-by-step instructions for the browser you are using (Mozilla, Microsoft, etc.). Finally, the collection and processing of your personal information and the recording of your telephone conversations with our customer service representatives will be governed by our Charter of Personal Privacy, available on this website under “Privacy,” and which forms an integral part of these terms and conditions of use. Broco Glass® reserves the right to modify at any time and without prior notice the content of this website or the services available on the site, or to temporarily or permanently cease operation of all or part of the website or its services. Furthermore, Broco Glass® reserves the right to modify at any time and without prior notice the internet location of this website and its terms and conditions of use. You acknowledge that Broco Glass® cannot be held responsible in any way to you or to a third party as a result of these modifications, suspensions or cessations. These terms shall be governed and construed in accordance with the laws of the Province of British Columbia. Any disputes related to or resulting from the validity, execution, interpretation or form of these terms shall be subject to the exclusive jurisdiction of the court of competent jurisdiction of the Province of British Columbia. 1.1 These general terms and conditions apply to the sale of all products (the “products”) and all services (the “services”) offered by Broco Glass®. 1.2 Unless otherwise agreed, any order for a product or service implies the customer’s full and entire adherence to these general terms and conditions. 1.3 The execution of all work is subject to prior signature of the estimate. This contractual document lists the work to be performed and, if applicable, the existing defects on the vehicle at the time it was handed over to Broco Glass®. The invoice issued by Broco Glass® functions as a subrogation in its favour granted by the insured customer for direct payment by the insurer. It also functions as a notice of loss by the insured customer to the insurer. Broco Glass® remains a third party in the contractual relationship between the customer and the insurer. As such, it is not authorized to advise the customer on the notice of loss, for which the customer is wholly responsible. The customer is encouraged to approach the insurer concerning any questions about the insurance policy. The customer may obtain, free of charge, by telephone, a detailed estimate of the services required for the vehicle. Broco Glass® shall not be bound by this estimate in the event of errors or omissions on the part of the customer concerning the features or condition of the vehicle. 4.1 Except in estimates issued by Broco Glass®, prices are based on rates in effect at the time the vehicle is brought in for service. If during the course of the repairs additional services are deemed necessary, Broco Glass® will immediately inform the customer in order to obtain his or her agreement before completing the repairs. The customer will likewise be informed if the time quoted for repairs must be changed due to specific features of the vehicle. 4.2 Unless otherwise agreed, the products and services are payable in cash, on delivery of the products or when the customer collects the vehicle, as appropriate. The customer can only collect the vehicle after full payment of all amounts due, in principal and incidentals, to Broco Glass®. 5.1 Broco Glass® reserves the right to refuse to carry out any work that cannot be executed in accordance with the customs of the trade. 5.2 As plastic do not provide protection against the weather and flying gravel, the customer is encouraged to replace any broken vehicle glass as quickly as possible. 5.3 Unless otherwise agreed, the transfer of risk occurs when the keys to the vehicle are exchanged. 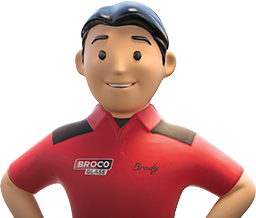 However, Broco Glass® declines all responsibility for the loss, deterioration or theft of objects in the vehicle or the vehicle, with the exclusion of the equipment and accessories incorporated into the vehicle and objects left by the customer at the customer service desk of the service centre. 6.1 It is up to the customer to verify that the appropriate services were received before accepting possession of the vehicle at the service centre. 6.2 All claims must be made to Customer Service in writing at the following address: Broco Glass® – Customer Service, 8288 Pie-IX boulevard, Montreal (Quebec) H1Z 3T6. 7.1 Unless otherwise agreed, the vehicle must be collected by the customer at the time indicated on the estimate or at the latest at closing time of the service centre on that day. Otherwise Broco Glass® may park the vehicle outside of the service centre at the customer’s sole risk. The transfer of risk shall be deemed to take place at the closing time of the service centre on the day agreed, and Broco Glass® will not incur any liability in the event of any theft or damage suffered by the vehicle. Furthermore, after 48 hours, Broco Glass® may ask the authorities to impound the vehicle, at the customer’s risk and expense. The transfer of ownership of the products shall occur on the full payment of the sale price and, if applicable, any incidentals and interest. In the absence of timely payment, Broco Glass® may reclaim the products at the customer’s risk and expense and, except in the case of a customer consumer, any prior payments will be kept by Broco Glass® by way of penalty. 10.1.1 Repairs and replacements carried out by Broco Glass® are guaranteed for life against defects resulting from a defective seal, poorly attached hubcap, leak, whistling or crack resulting from a repaired impact, during or after the provision of service. This warranty can only be activated by the presentation of the invoice for the contested service or the attestation of warranty issued by Broco Glass® and shall otherwise be declared ineligible. If the alleged defect results from an act or omission of the customer (including, among other things, failure to maintain, modification or unusual use) or of a third party (including, among other things, a repair or subsequent service by a third party), an accident or any cause unrelated to the replacement or repair service. If applicable, the replacement of products damaged through defective installation or repair. 10.1.4 In all cases, Broco Glass® reserves the option, especially in the event of the unavailability of a product, to limit the warranty to the reimbursement of the installation and the product damaged through defective installation or repair, to the exclusion of any other compensation. Such reimbursement shall be based on the price of the services or damaged products on the invoice initially issued by Broco Glass®. 10.2.1 Products are guaranteed for one year from the time of delivery against all manufacturing defects reported in writing to Broco Glass®. No warranty shall be granted for normal use or corrosion, abnormal use of the products, deterioration resulting from an accident, negligence, failure to upkeep or maintain, caused by a third party or, more generally, resulting from an event beyond the control of Broco Glass®. 10.2.2 This warranty is strictly limited, at the sole discretion of Broco Glass®, to the replacement or reimbursement of the product recognized as defective, within the limit of the amount actually paid to Broco Glass® for this product. This compensation is exclusive of any other compensation whatsoever. 10.3 Insofar as the sale of the products is subject to the provisions of the Consumer Protection Act either in view of its object or the status of the customer, it is further stipulated that these provisions cannot deprive the customer of the legal guarantees provided for under this Act. Personal data received from the customer is required to provide services, issue invoices and, if applicable, have costs covered by the customer’s vehicle glass insurance. This information (except for bank card numbers) is processed by computer and transmitted to the appropriate Broco Glass® franchisee location. The customer agrees for this data to be used and kept by Broco Glass® and its service providers and subcontractors for administrative purposes, in order to generate statistical reports, conduct satisfaction surveys for the purpose of improving the quality of its services, and carry out marketing operations. To the extent permitted by law, the customer has the right to access and correct his or her personal data. This right can be exercised by contacting customer service at the number or address listed above. In the event that a dispute cannot be amicably resolved, the dispute will be submitted exclusively to the court of competent jurisdiction in the District of British Columbia, Province of British Columbia. However, if the customer is a consumer who is not acting in a professional capacity, the rules of legal competency shall apply.